ARM and TSMC have taped-out the first ARM Cortex-A57 processor to use the foundry’s 16nm FinFET process. ARM has announced the tape-out of the Cortex-A57 at TSMC’s semiconductor foundry using a commercially available tool chain. The new chip is fabricated utilizing the Taiwanese foundry’s 16nm FinFET process and constitutes the first step between ARM and TSMC in optimizing 64-bit ARMv8 processors on FinFET process technologies. Apparently it took the two companies just six-months from design to tape-out. This first ARM Cortex-A57 processor application opens the door to customer implementations on 16nm FinFET ARM SoCs. ARM’s flagship Cortex-A57 processor is scheduled to find a home in the compute intensive environments of tablets, computers and even server products. Though it can be used as a stand-alone processor, the company also plans to pair the high-performance Cortex-A57 with the more efficient Cortex-A53 in what ARM likes to call big.LITTLE configuration. 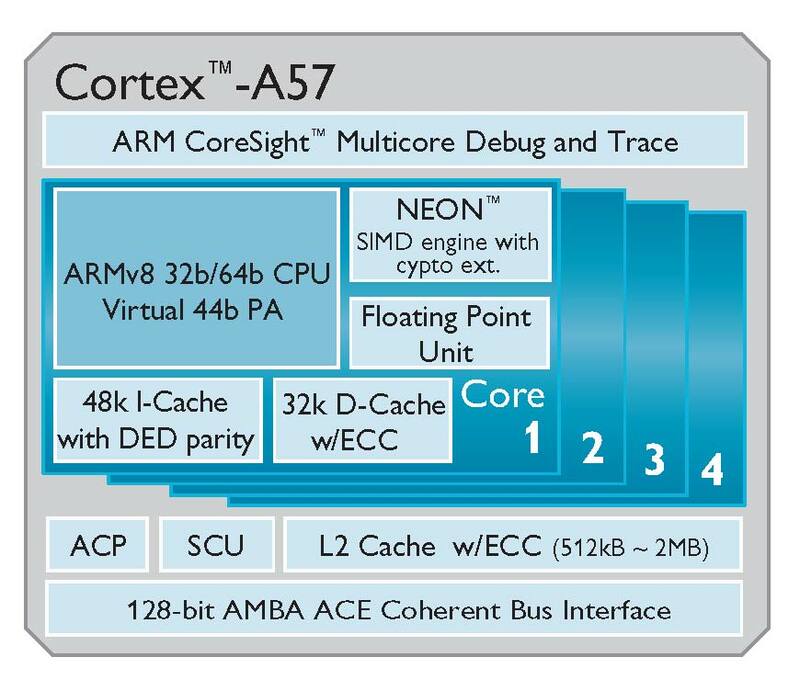 The Cortex-A53 is currently ARM's most efficient application processor, providing more muscle while using less energy when compared to the company’s Cortex-A9 processor. Unfortunately, no time-frame was given as to when all this new technology will make its way into actual products. Hsinchu, Taiwan and Cambridge, UK – April 2, 2013 – ARM and TSMC (TWSE: 2330, NYSE: TSM) today announced the first tape-out of an ARM® Cortex™-A57 processor on FinFET process technology. 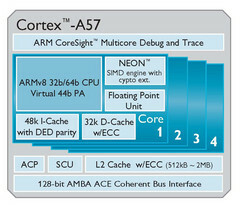 The Cortex-A57 processor is ARM’s highest performing processor, designed to further extend the capabilities of future mobile and enterprise computing, including compute intensive applications such as high-end computer, tablet and server products. This is the first milestone in the collaboration between ARM and TSMC to jointly optimize the 64-bit ARMv8 processor series on TSMC FinFET process technologies. The two companies cooperated in the implementation from RTL to tape-out in six months using ARM Artisan® physical IP, TSMC memory macros, and EDA technologies enabled by TSMC’s Open Innovation Platform® (OIP) design ecosystem. ARM and TSMC’s collaboration produces optimized, power-efficient Cortex-A57 processors and libraries to support early customer implementations on 16nm FinFET for high-performance, ARM technology-based SoCs. This announcement highlights the enhanced and intensified collaboration between ARM and TSMC. The test chip was implemented using a commercially available 16nm FinFET tool chain and design services provided by the OIP ecosystem and ARM Connected Community partners. This successful collaborative milestone is confirmation of the roles that TSMC’s OIP and ARM’s Connected Community play in promoting innovation for the semiconductor design industry.